Starting tomorrow, 8/1, when you use your CVS card, don't forget to check your receipt for an extra FREE savings coupon. Commonsensewithmoney says the coupon prints out on the bottom of your receipt and will be for a FREE CVS product! 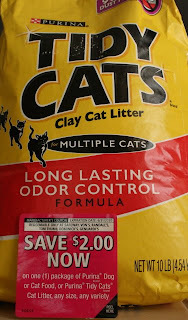 Also according to couponmommie, check your email for an in-store CVS savings coupon! She just received an email coupon for $5 off of $30 or more purchase. 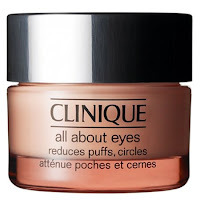 So along with all the above you can snag these FREEbies at CVS starting 8/2! Final Cost after coupons and ECB = FREE plus overage! This cracks me up what thefreebieblogger found! If your first name is Dave, David or Davy, then on August 30 you can receive a FREE entrée at Famous Daves. If your middle name is Dave, David or Davy you can receive 50% off your entree. Too funny! So.......Dave, David or Davy Click HERE to find a location near you. 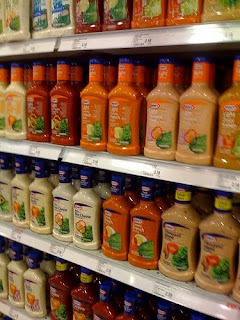 Kraft Printable Coupons - Hurry and Print!!! UPDATE: I did not realize that these coupons are Publix retailer coupons until one of my reader's, Susan, let me know. Although it is a Publix retailer coupon some retailers do accept other retailer coupons (for instance, Walmart). This is where YMMV (your miles may vary) come into play. It will be a hit or miss, but yes, you can use these coupons at other stores other than Publix depending on your cashier. Good luck and Sorry for any confusion. HURRY HURRY and print these valuable coupons Here before they hit their print limit like last time!!! Did you miss snagging the $75 off $100 at OldNavyWeekly yesterday when the site reloaded like the rest of us? Well, no worries. Now through Sunday (8/2/09), you can get 30% off your purchase at Gap, Old Navy, Banana Republic and their Outlet Stores with this printable coupon HERE. Last time they ran a deal like this was back in March during Spring Break and I was able to use my coupon as many times as I needed during the promotional period. This coupon should come in handy for back to school clothes. 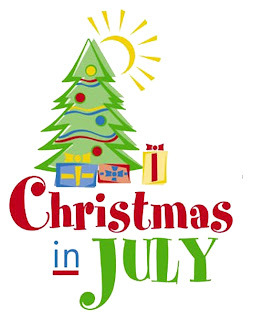 Christmas in July At Target!!! Lots of confirmation that Target's Christmas in July is HERE!!!! 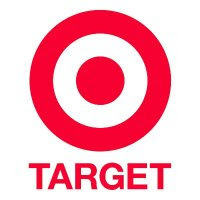 Hurry and head on over to your local Target to snag 75% off some amazing toys!!! In addition to all the great deals you can find at Target, check out the amazing list of specials at the Houston Galleria and Katy Mills mall that justfrugalicious put together! $0.06 Starbuck's Frappuccino at Walgreens TODAY! Good Morning Coffee drinkers!!! 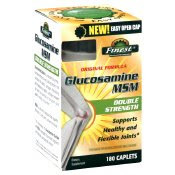 Check out what deal amyinorlando got from her MyCokeRewards. Print this $1.00/1 Starbuck's Frappuccino coupon HERE and score yourself some cheap Starbuck's coffee drinks at Walgreens! Now that's an eye opener!!!!! Here are some Whole Food FREEbies and Deals around the blogosphere right now. -$1/1 coupon in Whole Deal coupon booklet located at the checkout!!! Home Made Simple Coupon Booklet Available Again! Get the Homemade Simple booklet with up to $30 in coupons savings from HERE. Just like last time, it has a coupon for a FREE Cascade Rinsing Agent. Check out what hip2save came up with starting 8/2 at Walgreens! Final Cost after Coupons and RR = $0.13/each for 8! Are you off to Walgreens this week. If so, wait until tomorrow to recieve an extra 15% off your purchases and 20% off W brand purchases with this family and friends discount coupon HERE! While you're there, keep your eye out for Walgreen's new $.99 Children’s activity book which is filled with valuable coupons. There will be three coupon inserts this weekend! Smartsource, Red Plum and P&G. They will be pretty loaded so for a more detailed list of what coupons will be included click on the banner to the right which says, "Find out what coupons are in this Sunday's paper!" Here are some of my favorite Walmart deals out there this week! 2009 McAfee Internet Security: FREE after Rebate! 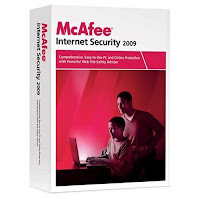 Right now you can get Get McAfee Internet Security 2009 HERE for FREE after rebate! It retails for $69.99, but is on sale for $60.00 at Amazon.com. What is even better is that there is a full price ($60.00) rebate link on the actual order page and this item ships FREE with super saver shipping. All orders must be made by August 1, 2009 to capture the savings! Still on vacation, but got an email from one of my readers letting me know about the FREEbie at World Market that you can snag today (i'm a little late on that) and tomorrow, July 29th. 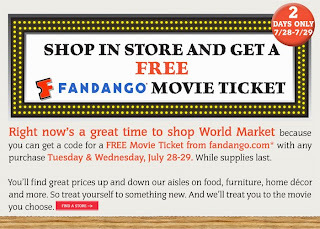 Get a code for a FREE Movie Ticket from fandango.com with any purchase July 28-29 while supplies last. Thanks Marta for sending me the heads up! Here are some of my favorite Target deals found around the blogosphere this week! Final Cost = FREE and up to $2.00 overage! Final Cost = FREE plus overage! Some additional deals still available listed HERE! Cellfire has reloaded Again!! Download your Savings Today!!!! $0.75/3 boxes - any flavor Hamburger Helper Tuna Helper OR Chicken Helper Home Cooked Skillet Meals. $0.50/2 boxes - any flavor Betty Crocker Fruit by the Foot, Fruit Gushers, Fruit Roll-Ups OR Fruit Roll-Ups Fruit Stickerz Fruit Snack. $0.40/1 box - any variety Betty Crocker Fruit Flavored Shapes. 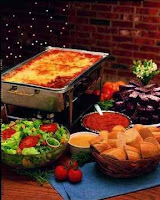 FREE Lasagne at Spaghetti Warehouse TOMORROW! In the mood for Italian food? Become one of Spaghetti Warehouse's fan on Facebook and get a FREE 15 layer lasagne tomorrow, Wednesday, July 29 from 11AM - 3PM. Lean Cuisine Awards FREE Coupons Every Friday! Right now, every Friday until October 29th, you could win a week's worth of Lean Cuisine entrées. Lean Cuisine will award coupons good for 7 Lean Cuisine entrées to 125 people each week. All you have to do is go on over to Lean Cuisine's Website HERE and register to win! You will also be automatically entered into their Grand Prize drawing to win a year's worth of FREE LEAN CUISINE® entrées! Here are some more FREEbies you can snag at Walgreens thanks to commonsensewithmoney! Final cost = $0.06 for 4 bubble mailers! 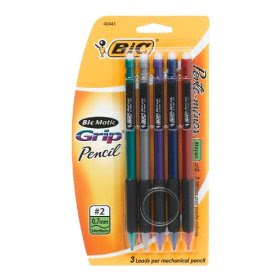 Right now at Staples you can snag yourself (4) Bic Matic Grip Assorted Mechanical Pencils, 5/packs for FREE! Final cost = FREE, FREE, FREE, FREE! 3 Day Sale ONLY (Sunday, Monday, Tuesday)! Final Cost = Free plus overage after coupon and ECB! Final Cost = FREE after ECB! -$3.00 MQ from August All You Mag. Final Cost = FREE plus overage after coupons if priced less than $6 wyb 2! Final Cost = FREE after using 2 coupons! Final Cost =FREE after coupon! Final Cost = FREE with coupon! FREE Weather Forcaster Radio at Walmart! 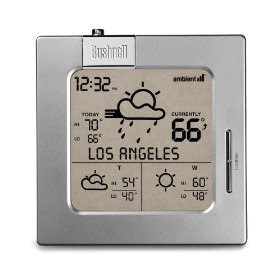 Check out what moneysavingmadness had to say about possibly getting a Bushnell Weather Forecaster Radio for FREE at Walmart. Right now, they are supposedly on sale from $99 to ONLY $50! Coupled with this $50 mail-in rebate (limit 3) and get yourself up to 3 FREE weather forecaster radios! Lysol.com has several high value printable coupons. Just click HERE, Register and print your coupons TODAY!!! Sign up to become a member of Simple and Delicious website and you will have access to these Conagra printable coupons today! CVS Printable High Dollar Coupons! CVS is NOW offering CVS printable coupons online HERE! Some of these coupons are High Value $5 coupons! For example -$5 off the CVS Skin Effects Sun Effects SPF 45 (expires 8/29). Sale prices have sometimes been as low as $6.99! So stacked with the $4/$20 purchase coupons posted HERE, you might be able to snag some FREE sunscreen or other CVS products! FREE Tea at McAllister's Deli TODAY! Today, Thursday - July 23rd, grab a FREE Tea at McAllister’s Deli . No purchase or coupon is necessary. Limit one per guest. 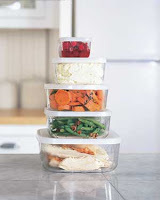 Frugal Fantastic Leftover Conversion Meals! Well once again, on vacation WITHOUT ANY COUPONS!! So how do I stretch that grocery dollar while we're away! One way is eating-in and eating leftovers! I LOVE leftovers! My family DOES NOT. So how do I make the most of it with my nose turned up leftover family? So how can I serve a well rounded meal and not waste food? Well, with the help of some great recipe blogs I was able to make 2 great leftover meals into 2 fantastic additional meals for 6 people! I love reading cooking blogs for meal ideas and just-cook-already is one of my favorites!! I used the leftover Steak, Broccoli and Rice to make just-cook-already's beef and snowpea recipe here and just substituted broccoli for the snow peas for the kids. My children LOVED IT!! Each recipe was easy and took hardly no time at all to make. Thanks just-cook-already! 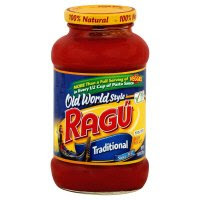 Also, my mother-in-law a while back told me to just make spaghetti sauce with leftover meatloaf by adding my favorite sauce, a couple spices and freezing it for later!! Loved that idea!!! So remember, even without coupons you can be creative and stretch that grocery dollar into great delicious meals!! Let me know your best leftover conversion meal! Coupons.com - High Value Printable Coupons which = FREE! Coupons.com rolled out a lot of High Dollar and Valuable printable coupons for you to snag yourself some FREEBIES this week! Print them now to make sure they don't hit their print limit. Remember to backspace twice to be able to print two!! Make sure to grab the softsoap that does not say elements on it! thanks zoey'smom! Final Cost = $.98 or $.49/each! Also, Cookie at HCW posted this: Between 6/28 - 7/25 Purchase one or more Colgate Total Toothpaste and/or Colgate 360 Toothbrushes and get a $1 Register Reward. All items must be purchased in one shopping order. I'm not sure what they are selling for at Walgreen's, but might be a great deal after coupon and RR if you have Register Rewards you need to roll. Restaurant.com is offering BIG Savings once again!! 80% Off w/every $25 Gift Certificate Order when you use code NAPKIN. Pay $2 thru 7/28/09 only at Restaurant.com. Nestle Pure Life $1.50 Coupon! The Nestle Pure Life Water Deal that I posted HERE has gotten even better! If you have a Randall's/Tom Thumb or Safeway nearby you'll want to print off these coupons! Hurry because the sale ends TODAY!!! 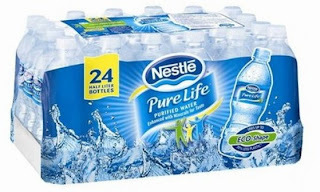 Save $1.50 on one (24 pack or larger) of Nestle Pure Life Water! You can print HERE or HERE. Remember to press your browser back button to print a total of 2 coupons per computer. 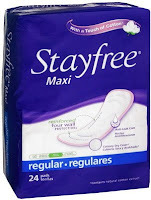 FREE Stayfree Pads at CVS the Week of 8/2! Here is another FREE deal at CVS the week of 8/2, in addition to the FREE Electrasol posted HERE. Thought I had posted this and just realized I didn't! Oops! 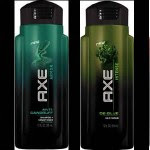 Several magazines have a coupon for a FREE Axe shampoo or conditioner ($5.49 value). Coupon expires 8/31/2009. If your Target store has these Kashi single-serve cereals use this Target Coupon good for $1/1 on any Kashi cereal to get them absolutely FREE! 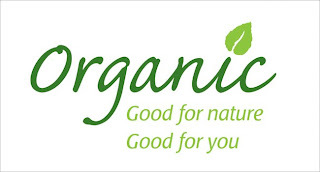 I recently posted HERE where to find organic coupons - mailed directlly to you, printable or actually at the store's check out! I'm excited to find even more organic coupons! Right now if you head over to MamboSprouts, you can sign up to have coupons mailed directly to you or have them sent by email or BOTH! In addition, you can also head over to Browncowfarm to snag their E-coupons! Also, I forgot to mention in my orginal Organic Coupon post HERE that you can also print coupons for Horizon products HERE! Now if Bell & Evans would get on the organic coupon band wagon! I emailed their corporate office asking them if they had any coupons available and recieved an "I'm sorry not at the current time" response. "Bummer!" Remember, if you have an item your family really enjoys (organic or not) don't hesitate emailing the company to ask if they have any coupons available, most of the time - THEY DO! FREE Electrasol at CVS the week of August 2! 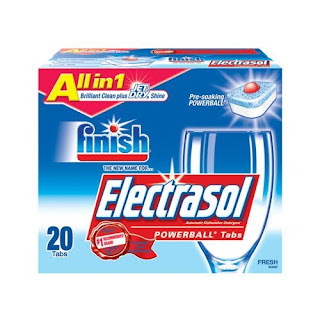 A while back, my mother-in-law and one of my friend's told me that their dishwasher repair man told them that Electrasol was the best dishwashing detergent to use for their dishwasher. I have been a loyal user ever since. Then Randall's had their Promo Event HERE and I tried out the Electrasol Finish and I am convinced even more that it is AMAZING!! at least for my dishwasher it is the perfect cleaner! A little FYI - some stores price this item for as much as $5.99/each! Final Cost after Coupons and ECB = FREE! FREE Pastry at Starbucks on July 21st! Tuesday, July 21st stop by Starbucks between opening - 10:30 AM to get your FREE Pastry wyb (when you buy) any beverage. All you need to do is become a Fan of Starbucks on Facebook and click on the FREE Pastry Tab. 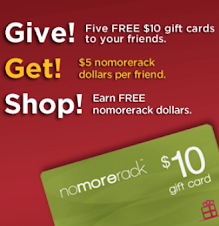 You can print or download the FREE coupon to your mobile phone! 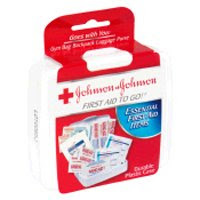 Spend $10 on Band-Aid, Johnson & Johnson or Neosporin Products (psa $2.99), Earn $5 ECB (limit 5). -$3/2 J&J First Aid products found at Walgreens. 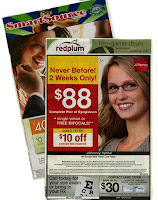 Starting this Sunday, July 19, 2009, you can snag 3 FREE "Easy Rebate" items at Staples and 1 FREEbie with Staples Rewards! 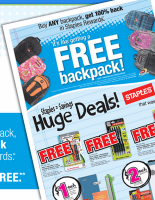 Plus buy ANY BACKPACK and get 100% back in Staples Rewards HERE , it's like getting a FREE backpack! Staples Rewards are checks that get sent out on a quarterly basis that can be used for future purchases at Staples. Staple Rewards will be mailed in October. Valid in-store, at staples.com or by phone! Final Cost = FREE after in-ad coupon! Don't forget before you head out to upload your Cellfire, P&G, and Shortcuts (e-coupons) to your loyalty card. You may forget your coupons, but your loyalty card won't! My Kroger store is located in Houston and doubles coupons that are .50¢ and triples up to .39¢. It will only accept 3 of the same coupons. Final Cost = FREE plus money maker! Let me know what I missed and what you find!